Well I didn’t think it was possible but things happened this weekend that created the perfect storm of flavor in my mouth! I mean, this was a great series of events that led to me having one fantastic meal this weekend. I figure I should just run down a little of the scenario leading up to this weekend. Last week I met up with Michael Baxter from www.baxtersoriginal.com and for those of you that are Twitter fans he is knows as @BaxtersOriginal (it wouldn’t hurt to give him a follow) at the Smokin’ on the Suwanee BBQ competition. I had a good time at the place but man oh man was it hot. Well, Mike saved my live with a cooler full of ice cold adult refreshness (I still owe him for that) and also a sample of some of his wood. I had honestly never smoked with Maple and was very excited about trying it out. My only problem was that I wanted to make sure this sample was put to good use and didn’t waste anything. So I waited a little time and my oh my, I have never had wood chunks so easy to smoke with and the smell and flavor from the Maple was fantastic. I now am on a mission to get as much variety of wood from him that I possibly can. Hey Mike look out for an order from me soon! Now, I know I said “Perfect Storm of Flavor” and here is the addition that make it perfect. 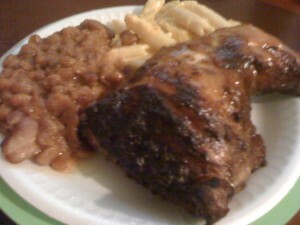 We all know Tom at www.bigbutzbbqsauce.net (Tweet him @BigButzBBQ) and truly appreciate his saucy passion. I have been able to Tweet with him for a while and know with 100% certainty that this man loves BBQ and BBQ Sauce. I’ve been threatening for a while to place an order and get some sauce to try out. Well, I finally did it and my order came in on Saturday. I opened the mailbox and immediately began to drool in anticipation of this sauce. I received a jar of his Cranberry sauce, a jar of his Original sauce, and a jar of the No Butz sauce which is definitely hot enough to make your tastebuds dance. Check out his flavors here. Well, the problem was that it was raining like crazy so getting out to the smoker just wasn’t gonna happen. So I pulled my grill up onto the porch got it hot and added some soaked maple wood chunks beside the coals. This turned out perfect and long before I ever added the meat I had the best smelling yard around. This wood had just the best smoke aroma I have ever smelled and believe me it will be used much more. 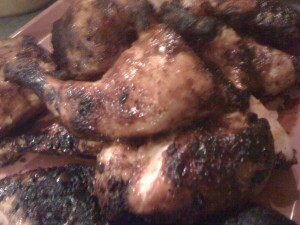 Once the grill got hot I added a few of the leg quarters and immediately began brushing them with Big Butz Original BBQ sauce. The grill was super hot so I just kept turning these things about every 2 minutes and constantly brushed them with sauce. I kept repeating this process for about 30 minutes and this what I learned. As the chicken cooks and the heat seals the sauce, this process helps to keep the chicken jucier and more tender than I have ever had. I don’t think words can explain what happened to me as I took my first bite but I will try to explain. As I bit into the chicken the sky cleared, it stopped raining, a ray of sunshine came down onto the house and a rainbow appeared in the sky. Well, maybe that just happened in my mind but this was as close to a miraculous event as you can get. The chicken has a perfectly smoked flavor thanks to Baxters and top that with the sweet and tangy taste from the Big Butz sauce it was perfect. 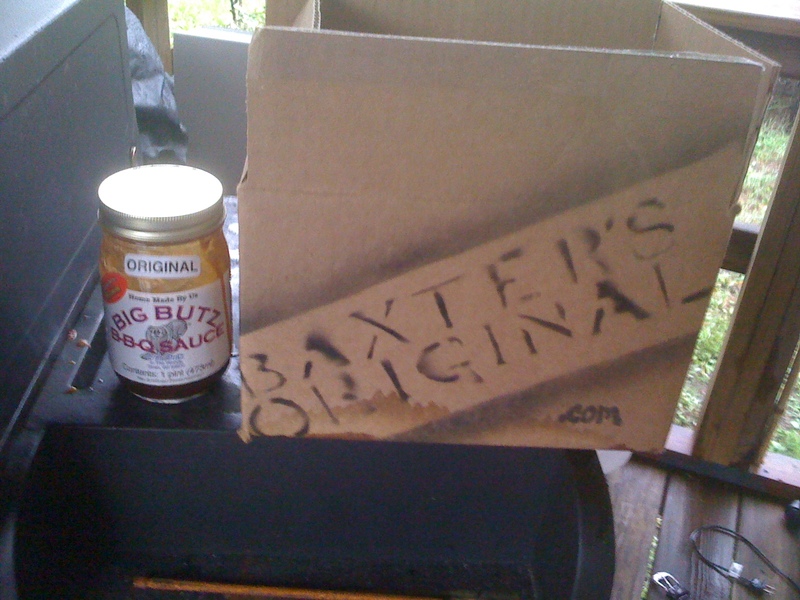 If you love BBQ you really owe it to yourself to pick up a bag of wood from Baxters Original and a few jars of sauce from Big Buts and try this out for yourself. Whoo Whoo! Big Butz “No Butz” on a leg quarter – over Maple – D A N G!